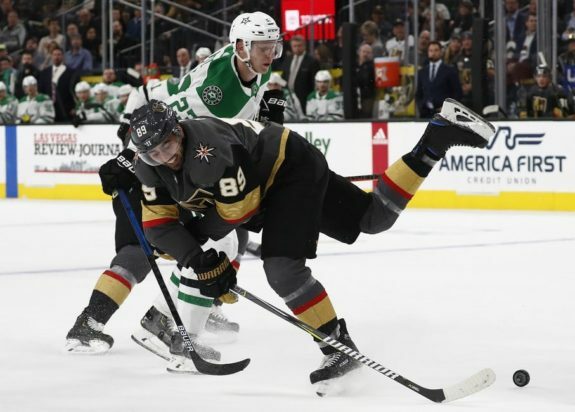 LAS VEGAS — Alex Tuch got his 10th goal of the season and the Golden Knights won their fifth straight at home, beating the Dallas Stars 4-2 Sunday night. Tuch became the fifth Golden Knights player to reach double figures in goals just before the end of the second period, when he chopped a loose puck just past defenceman Miro Heiskanen’s skate and through goaltender Ben Bishop’s five-hole to give the Golden Knights a 3-1 lead. Hanzal, who had spinal fusion surgery in March and made his season debut on Friday, shielded Fleury perfectly and was in the right spot to deflect Heiskanen’s shot into the net to give Dallas the early 1-0 lead. The Golden Knights highlighted the scoreboard in the second period with a pair of even-strength goals immediately following power-play opportunities, including Tuch’s game-winner. Karlsson collected a cross-ice pass from Nate Schmidt, skated inside the circle and lasered the puck through Bishop’s pads 3 seconds after the Stars killed off an interference penalty on Hanzal. Smith’s empty-net goal with 28 seconds left provided the final margin. NOTES: Karlsson has scored a goal in five of his last eight games. … Vegas leads the NHL with 887 hits, but were outhit by the Stars, 31-23. … In his first two games back on the ice, Hanzal is 13 for 21 (61.9 per cent) from the faceoff circle in 26:06 of ice time.